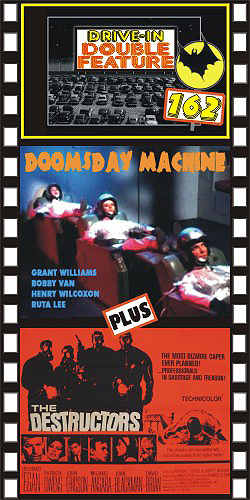 THE DOOMSDAY MACHINE (1967) Grant Williams, Henry Wilcoxon, Denny Miller, Mala Powers, Bobby Van, Ruta Lee. A spaceship hurtles toward Venus. Its crew is soon horrified as they see the Earth destroyed by a nuclear holocaust on their telescreen. A doomsday device has destroyed the planet! They devise a plan to save what's left of humanity. Color, 16mm. PLUS: THE DESTRUCTORS (1967) Richad Egan, Patricia Owens, John Ericson, Michael Ansara, John Howard. Interesting sci-fi and espionage. Spies are after "laser rubies," which can power killer laser beams. Government man Egan is out to protect the rubies and eliminate the foreign agents. No classic, but pretty good drive-in fun. Interesting to see an aging Howard (Bulldog Drummond) in a supporting role. Color, 16mm.